In my utopia, I would be able to recreate as I worked. Huh...he has completely lost it now! Maybe, but if I could listen to music or news/talk radio while I did chores around the house and the yard I be much happier doing them - they then don't seem like chores at all. The problem is that so many of the chores that I have accepted as my assignment in our household involve noisy machines - lawn mowers, saws, drills, hedge trimmers, etc. And it is nearly impossible to listen to my MP3 player while operating these machines. When these machines are on, I find that I have to keep the volume on very high levels, just to be able to barely hear a program - and that is not good for the ears. And when the machines are intermittently turned off, the music is suddenly way too loud to bear and I end up spending too much time and effort adjusting the volume. Enter "in-canal" headphones, or sometimes called "Ear Phones". These devices are designed to sit in your ear canal, and typically have the tips made of some sort of pliable material that allows the 'phones to be pushed a bit into the canal and then they expand back to provide excellent sound isolation from the external environment. Some models claim as much as 25db of noise reduction, unfortunately the importer was not able to get the engineers back at the factory to provide the isolation specs for the review samples. 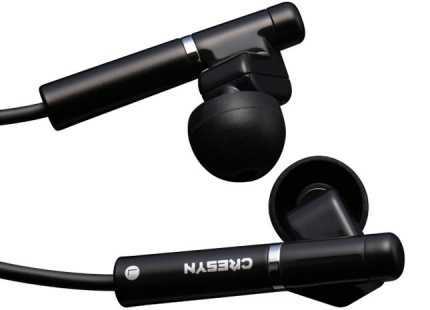 The Cresyn C750E's are supplied with a nifty carrying pouch and 2 sizes of ear buds. You pick the size that best provides a snug fit in your ear canal and the most isolation. My ears, of course, needed the larger sized buds...yes, I know, big head and all. But once the buds are in place, the isolation is quite remarkable - I tested out the isolation properties while mowing my lawn with a gas-powered lawnmower. I could listen to news and talk podcasts at a moderate volume, while protecting my ears from the noise of the lawn mower. The ability to protection my ears from noise and the ability to enjoy podcasts or music while operating noisy machinery alone warrants the price of admission. Listening to an "in-canal" set of headphones is quite a different experience from an "over-the-ear" design like the Sennheiser HD497 that I have been using for so very long. For one thing, as soon as you plug in the "in-canal" phones you feel a sense of isolation from the rest of the world and it becomes much easier to be drawn in by and to focus on the music. I can't say for sure if the spatial experience is better with the "over-the-ear" designs, since I felt the Sennheisers were inherently better at bass depth and delivering a sense of space. The Sennheisers had just a slight edge over the Cresyn in terms of Bass depth and extension. But, I do want to be quite clear that this is a very slight difference, the kind that I could only discern after many repeated trials of listening to the same section of music. I'd imagine that in everyday use one may not really be able to tell a difference between the two, and obviously neither would be used in a situation calling for the very high end of headphone performance. The Cresyn could not handle the bass lines of the electric guitar on this track, the driver was obviously distorting as it was pushed way beyond it's limits. And this was at a lowish volume level, this is inexcusable performance. The two units were very close in performance, the Sennheisers seemed a bit better at midrange detail. But it was too close to call the Sennheiser a clear winner. The Sennheisers were a bit better at detail and resolution, but not by a wide margin. Unless you were critically listening, you may not be able to pick out a difference. I like what In-Ear headphones do - they provide protection for your ears in noisy situations and also a great sense of isolation which results in greater opportunity to feel a sense of immersion in the music. These one's in particular also fit that bill of protection, isolation and immersion; and sonically compared quite nicely to my long time over-the-ear standbys through most of the frequency range. But when it came to very low frequencies (I'd say lower than 30hz), these earphones completely fall apart. The resulting distortion is horrid and makes these headphones definitely not recommended for music, but they are fine for news and talk radio.